The Ficus binnendijkii ‘Alii’ or Alii Ficus tree is a less commonly seen species of the Ficus genus. Most people are familiar with the Ficus benjamina or Benji tree. 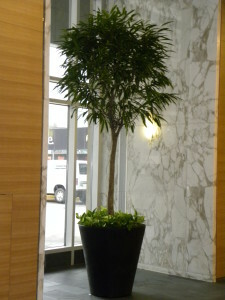 The Ficus ‘Alii’ has longer, more slender leaves which droop somewhat. Like the Benjamina, the Ficus ‘Alii’ requires good light. We will only recommend this tree if it will be positioned close to a west or south window. In light that is too low, the tree will quickly shed its leaves. 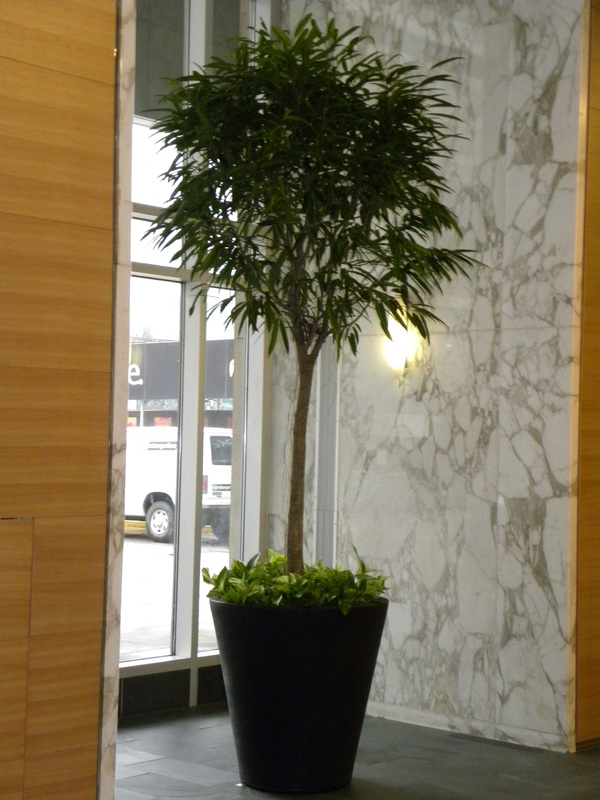 In the right location, this tree can make quite a statement in an office plantscape. It is available in heights from 4 feet to over 15 feet. Once established, it will thrive for many years, with few problems. The smaller trees are often sold with braided trunks. A newer variety of this Ficus , the ‘Amstel King’, has larger leaves that are long, but wider. This variety is thought to be a bit less temperamental than the Ficus benjamina. It can better tolerate changes in its environment such as temperature and humidity fluctuations. Not enough light for this tree? Consider an artificial version instead. See the image on the right. 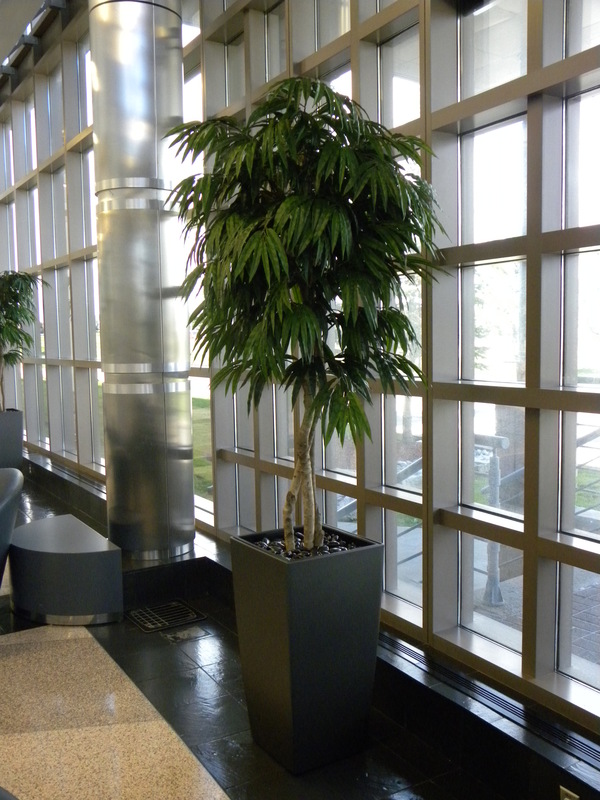 A custom built, multi-stem artificial tree with real wood trunks can be a great alternative. The Ficus ‘Alii’ is native to Malaysia,Java and Borneo where it grows in almost swampy conditions and can reach heights of 30 meters. When used indoors, it is important to keep this tree quite moist at all times. Make sure it is kept in a planter with good drainage though, so the roots do not rot. The dry air inside during winter is very hard on this plant. Try to increase the humidity if possible to prevent leaf drop.